Our school has an annual Take Your Kid to Work Day, lovingly and ridiculously referred to as TYKTWD. We’re in D.C. We like acronyms for everything. It’s insider lingo. I asked Sissy if she wanted to come with me. I imagined her adoration as she saw her mother in a different light. I pictured students stopping me as I crossed campus to profess their devotion to the ways I had transformed their writing through my teaching. I know. I know. Sissy mentioned something about a killer game of foursquare at recess that she didn’t want to miss. My dreams were crushed. Then little Piper piped up. Off we went. First, on the train. Where Piper read me all the rules. No eating. No standing in front of the doors. No loud music. No drinks. Then she spilled her water all over our Metro seat. 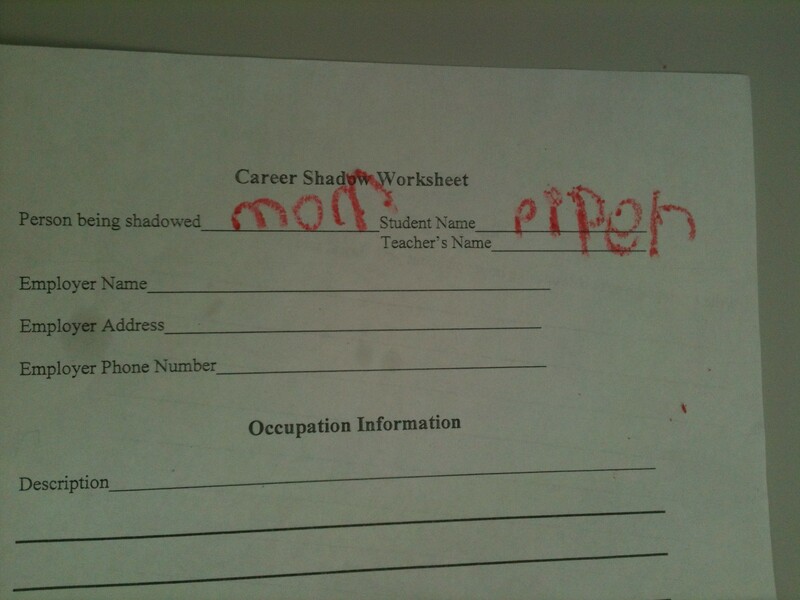 During my class, after my students fawned all over the Piper, she busied herself with her Career Shadow worksheet. The lesson continued. 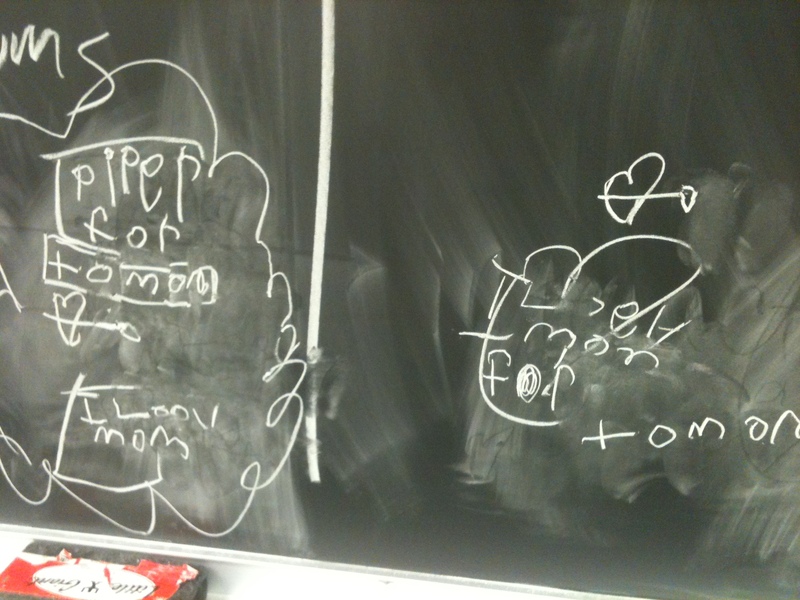 As my students brainstormed possible presentation ideas, I wrote them on the chalkboard. Then we began analyzing the argument and evidence for each. They talked, I wrote, we learned. Piper joined in. There was a chalkboard and chalk. She couldn’t help herself. Just as I was about to sit her back down so that she wouldn’t be a distraction, she wrote this. Awwww. I’m not sure what Piper learned on TYKTWD but I know that she LOEVs MOM. This entry was posted in Daily Dharma and tagged career shadowing, chalkboards, college composition, dc, metro, take your kid to work day, train by melissa.scholes.young. Bookmark the permalink. Love this post. Small typo in the title and first paragraph “take your kid to word day”. Love this though. Great post. Thanks, honey. Even English professors have typos, apparently. I am so, so sad I was not on campus for this. It was a hoot. I suspect you and Piper are cut from similar cloth. You’d get each other.